3 Proven ETF Sector Rotation Strategies You Must Know! | Wealthy Education - Investing Strategies That Work! →3 Proven ETF Sector Rotation Strategies You Must Know! 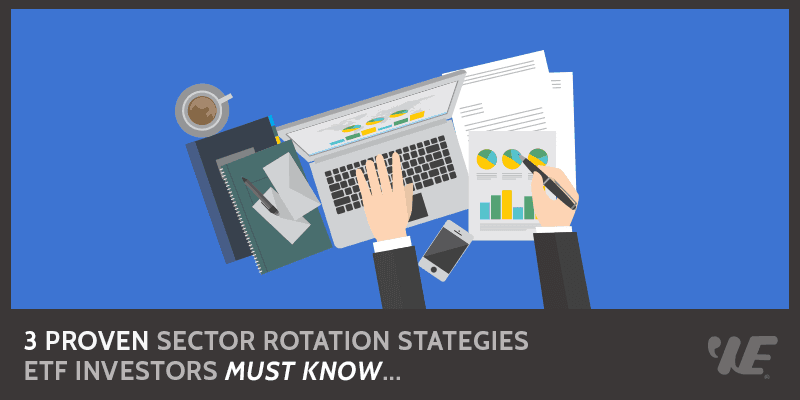 3 Proven ETF Sector Rotation Strategies You Must Know! When approaching the question of how to invest in ETFs for the best possible returns, you should consider the proven technique of a stock market rotation strategy. All sector rotation strategies are based on the concept of sector investing, which is simply the purchase of stock in companies that represent a specific market category, such as retail, energy or technology. As such, ETFs lend themselves perfectly to this approach. Because different businesses and industries perform predictably better at different times, and under different circumstances, you can use these cyclical patterns to effectively switch your ETF holdings from one sector to another, in order to magnify your overall returns. Now let’s examine the three predominant strategies for rotating ETFs by sector in order to make the most of economic, seasonal and geographical market fluctuations. By far the most common stock market rotation strategy involving ETFs is the one that follows the ever-changing economic cycle. This technique is generally a long-term investment approach, and relies on the fact that the economy tends to go through a predictable and repeatable cycle. Over the course of a number of months or years, recession leads to early recovery, and full recovery leads back into early recession. Most stocks, in turn, will mimic and generally lead this pattern in some form, with different market sectors having a tendency to perform best during different phases of the economic cycle. For example, the S&P 500 market is divided into nine major sectors, each of which have been determined to display their best potential for returns during a specific stage of the standard economic progression. In general, when the economy, and hence the stock market, bottoms out, technology and financial funds are often among the best performers. As the market improves, the industrial and base material sectors begin to pick up, followed by the energy industry. As the economy begins to decline again, health care and utilities come into their own. By determining which phase of the economic cycle we are currently in, and which segment of the market tends to perform best during that phase, you can simply buy ETFs in the strongest sector, and sell them and move into the next sector when the first reaches its peak and begins to decline. Of course, this strategy can prove more difficult to follow in real time than on paper. The economy, and its accompanying market sectors, may not always follow their historical cycles exactly as they’ve been defined. Trends can sometimes be difficult to predict, and when recession hits, there’s always the possibility that every sector will show decline. But if you are willing to do some homework, ETF investing offers the ideal way to take advantage of the market sector rotation strategy, requiring less research time, and providing better risk protection, than individual stock investing. [alert-note]⇒ Investing Tip: Rotate your investment and re-diversify your investment portfolio when there is a variation in the economic cycle. • When the economy is going up, invest in ETFs that track cyclical stock sectors. Unlike an economy based rotation strategy, one based on seasonal fluctuations offers the advantage of providing more short-term benefits. Many market sectors exhibit patterns that can help to produce maximum investor returns multiple times during a calendar year, including those like the retail sector that increases during the autumn school shopping and Christmas seasons, and the energy and utility sectors that tend to surge during the winter months in colder climates. If you research ETFs by sector, and develop a pool of knowledge based on the various consumer events that tend to drive them throughout the year, you will understand the best times to purchase and sell the funds that represent their respective categories. In addition to the retail and energy sectors already discussed, you could consider ETFs that allow you to make the most of the summer driving and winter travel seasons. During these times, investing in sectors that include hospitality, accommodation, fuel, and airline companies may help to boost your overall returns. It’s important to remember that many market sectors begin to increase and decrease in response to their annual consumer demands well before their peak season arrives and departs, so you should study their historical performances to determine the most effective times to buy and sell. And, as with any investment strategy, you should never assume that a given market sector will perform well just because it’s supposed to, particularly during an economic downturn. Wait long enough to ensure that a given sector is demonstrating its anticipated growth before you buy any corresponding ETFs. The exploration of ETF investing by way of a rotation strategy would not be complete without considering the potential gains offered by regional investments. Just like your home country, global markets experience economic cycles that can translate into lucrative returns if you know which country ETFs to invest in and when. In particular, the category known as emerging markets may be well worth considering, since it specifically represents worldwide companies that are currently in their growth phase, perhaps because they are generating a product or service that is in high demand. Naturally, emerging markets are not without their risk, since a lot of the companies involved may be younger and without a well-established history of strong returns. But growth trends can bring significant financial rewards to those with a higher risk tolerance. Meanwhile, a region-based rotation strategy also offers potential in terms of sector ETFs that indirectly support the industry growth in certain countries. To take advantage of this, you could consider investing in funds that include local energy, construction, and other infrastructure-based businesses. If you are willing to take an active role in the management of your ETF investments, sector rotation strategies can be a great way to capitalize on largely predictable trends in the economic cycle, seasonal consumer spending, and global market growth trends. There is a level of risk associated with any active trading, so it’s crucial that you invest the time to thoroughly research both the strategies outlined here, and their corresponding Exchange Traded Fund opportunities. Remember that buying and selling ETFs will often necessitate paying commission fees, but ideally, any increase in returns you experience as a result of these methods should more than make this a worthwhile cost of doing business. 5 Proven Strategies to Invest in ETFs that Work for You!